Mixed forests (insofar as our very few specimens bear habitat data). This species also occurs in southern South America; it ranges north from Lake Superior to James Bay and west to the Pacific coast but is not as disjunct as O. berteroi. 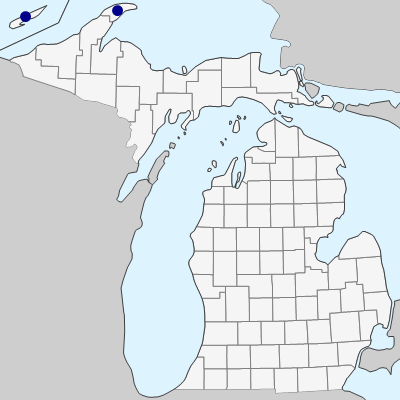 Known only from Isle Royale and adjacent Islands, and Manitou Island off the Keewenaw mainland, this rare species can be difficult to key with immature fruit. However, very young fruits of O. depauperata are distinctively clavate, with the widest point at the very apex, immediately below the styles. Those of O. berteroi are less clearly so, the widest point usually clearly below the apex. MICHIGAN FLORA ONLINE. A. A. Reznicek, E. G. Voss, & B. S. Walters. February 2011. University of Michigan. Web. April 26, 2019. https://michiganflora.net/species.aspx?id=131.